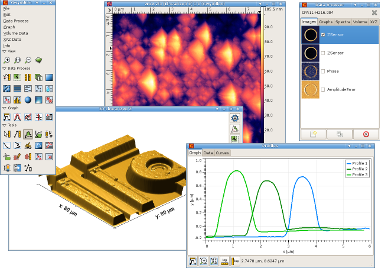 Gwyddion is a modular program for SPM (scanning probe microscopy) data visualization and analysis. Primarily it is intended for the analysis of height fields obtained by scanning probe microscopy techniques (AFM, MFM, STM, SNOM/NSOM) and it supports a lot of SPM data formats. However, it can be used for general height field and (greyscale) image processing, for instance for the analysis of profilometry data or thickness maps from imaging spectrophotometry. Gwyddion provides a large number of data processing functions. including all the standardd statistical characterization, levelling and data correction, filtering or grain marking functions. And since the developers are active SPM users, the program also contains a number of specific, uncommon, odd and experimental data processing methods they found useful – and you may find them useful too. Gwyddion is Free and Open Source software, covered by GNU General Public License. It aims to provide a modular program for 2D data processing and analysis that can be easily extended by third-party modules and scripts. Moreover, thanks to being free software, it provides the source code to developers and users, which makes easier both verification of its data processing algorithms and further program improvements. Gwyddion works on GNU/Linux, Microsoft Windows, Mac OS X and FreeBSD operating systems on common architectures. All systems can be used also for developement. It has a modern graphical user interface based on the widely portable Gtk+ toolkit, consistent across all the supported systems. 2017-08-15: Version 2.49 “Window to the West” was released. As usual, it brings a bundle of new modules and various improvements – and also module bundles. The most noticeable changes are, nevertheless, a new much nicer icon set by Felix Kling and a better widget for adjusting the bazillion parameters of various algorithms. See the detailed news for the complete list of changes. 2017-08-12: Petr’s talk Gwyscan – library for smart scanning paths about gwyscan was added to presentations. See also the related paper . 2017-08-11: There seems to be still some interest in GIMP image generation plug-ins Yeti wrote 15 years ago – and abandoned essentially when Gwyddion development started. Although resurrection is unlikely, the good news is that their ideas have found their way into Gwyddion synthetic data modules. We added some information about the correspondence between them . 2017-05-11: A list of Gwyddion-related publications was added – more specifically, publications describing Gwyddion architecture and algorithms or otherwise related to the software in a fundamental manner. 2017-04-29: Version 2.48 “Magnetic Monastery” was released. It brings a bunch of MFM-related modules as well as the usual collection of new and improved file import modules and bugfixes. There is also a new translation, Brazilian Portugese. See the detailed news for the complete list of changes. 2017-01-18: A Fedora 25 repository was added. We are sorry for the delay. 2016-11-18: Version 2.47 “Pythocalypse” was released. It would be mostly a bugfix release, repairing selections that did not work properly in several modules. Except for one thing, a complete overhaul of pygwy (including a few API changes). And finally, Python scripting is also described in the user guide now. See the detailed news for the complete list of changes. 2016-10-31: A patch for version 2.46 was published, fixing broken function gwy_selection_set_data() that affects selections in Correct Affine, Measure Lattice, Straighten Path and a few other functions. See also Patches . 2016-10-18: A patch for version 2.46 was published, fixing compilation failure of the JPK scan file module when minizip is not available. See also Patches . 2016-10-14: Version 2.46 “Lichen Logistics” was released, bringing geometrical shape fitting, a new grain marking function, editable toolbox, new file modules and lots of other improvements. See the detailed news for the complete list of changes. 2016-09-04: Gwyddion has conquered space! The analysis of comet dust images from the Micro-Imaging Dust Analysis System (MIDAS) in the famous Rosetta space probe studying Comet 67P/Churyumov-Gerasimenko employed Gwyddion. See the ESA blog post and the full paper in Nature . 2016-07-21: A Fedora 24 repository was added. In related news, a patch for version 2.45 was published, fixing broken installation of API documentation with gtk-doc 1.25+ (which can in turn break package builds). See also Patches . 2016-07-20: A new version of the sample standalone module was released: threshold-example-2.5. A bug affecting the Mask mode was fixed and the handling of settings now more closely matches a typical Gwyddion module. A few pieces of the code were also slightly modernised (without increasing minimum required Gwyddion version). 2016-04-27: Version 1.2 of libgwyfile was released. The library was updated to handle new data types introduced in Gwyddion 2.45. 2016-04-26: Version 2.45 “Scatter and Slither” was released with a large number of new features, user interface improvements – and also initial native XYZ data support. See the detailed news for the complete list of changes. 2016-03-20: Some results, the ‘right’ values and remarks to the user influence survey are now available. See the description of each individual task for a link to the results and remarks. There may be some further elaboration and refinements, anyway, the results will hopefully satisfy your curiosity for now. 2016-03-01: The user influence survey is now closed. Thanks all who participated. We will publish the ‘right’ values and some remarks here after the Nanoscale conference. 2016-01-31: We have received a fair number of responses in the user influence survey so far and would like to thank all who participated. The survey form will be open to the end of February (which is also when the MS Windows installer will finally stop advertising it). If you have not tested your data processing skills yet please download the survey images and fill your best estimates in the form. Thanks! 2016-01-12: Version 1.1 of libgwyfile was released, fixing a couple of bugs and improving error reporting and MSVC support. 2016-01-11: Version 2.44 “Entropy Everywhere” was released, bringing a few new features, but mainly lots of bug fixes and file format support improvements. As usual, the detailed news lists them all. 2015-12-20: A Fedora 23 repository was added. Note there were a few problems with various auxiliary developer scripts (cross build, night build, …) in F23. The scripts should be generally fixed in svn now. 2015-11-16: Complete MSVC development package is now available for Gwyddion compilation and development with Microsoft Visual Studio 2015. The package was prepared for Gwyddion 2.43 (the last stable version) and is still under development. Feedback is welcome. 2015-11-25: Version 2.43 “Respectable Rotunda” was released. The number of improvements and bug fixes is large but they are scattered all over the program. See the detailed news for their full list. 2015-11-02: Broken Fedora 22 repository causing the RPM signature check to fail with ‘No such file or directory’ was hopefully fixed. 2015-10-07: Version 2.42 “Even Enlightenment” was released. The change everyone will probably notice is the new line correction module. There are however plenty of other improvements. See the detailed news for a full list of changes. 2015-07-29: We lost a few recent commits in the restoration of subversion repository from backup. The corresponding changes have been recommitted and subversion should be working normally now. However, the revision history since r17212 (including) has changed. It is recommended to check out fresh working copies of all svn modules and transfer any changes you might have to the new copies. If you have a working copy updated to a r17212 or later, you must check it out afresh. If you observe anything odd with subversion please report it. 2015-07-16: There was a major outage of SF.net services due to a storage failure. File download works, but subversion, discussion, etc. are out of order at this moment. Details can be found at the SourceForge blog . 2015-07-13: Version 1.0 of libgwyfile was released. Several bugs were fixed since version 0.9 and MS Windows support was greatly improved. The library is considered stable now.